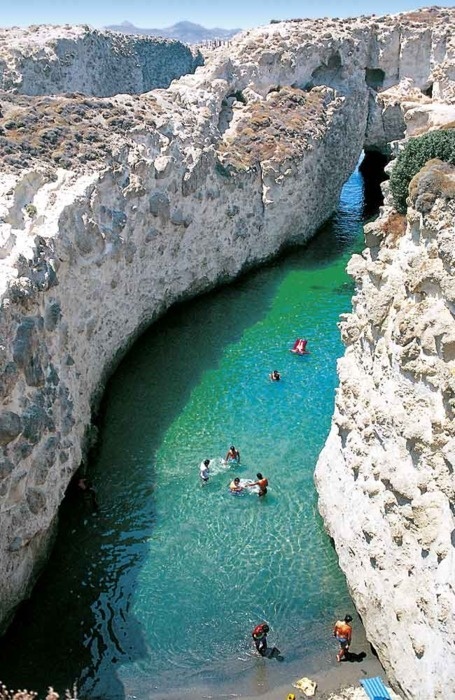 Milos, is a volcanic Greek island in the Aegean Sea, just north of the Sea of Crete. Milos is the southwesternmost island in the Cyclades group. The island is famous for the statue of Aphrodite (the "Venus de Milo", now in the Louvre), and also for statues of the Greek god Asclepius (now in the British Museum) and the Poseidon and an archaic Apollo in Athens. The Municipality of Milos also includes the uninhabited offshore islands of Antimilos and Akradies. The combined land area is 160.147 km² and the 2001 census population was 4,977 inhabitants.